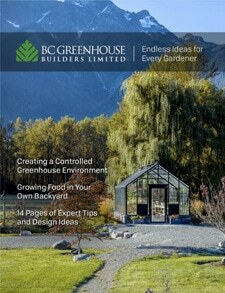 Sunshine On Your Face in Garden Greenhouse | BC Greenhouse Builders Ltd. I close my eyes as I bask in the sun, heat on my face. I take off my jacket and then my hat. My neighbors, friends and family have gone away to Martinique, Belize and Spain but I am experiencing the best holiday. I am sitting in the sun at home – in my garden greenhouse. I am listening to podcasts, taking cuttings of raspberries and transplanting peas. It’s early March and my hands are in the soil and my heart is in the clouds. My greenhouse is my playhouse, my happy place and my stay-cation all at once. Helpful husband initially built me an 8 x 12 Cross Country greenhouse. It cost us about the same as a one-week all-inclusive tropical holiday for two and I have grown in it for ten years. 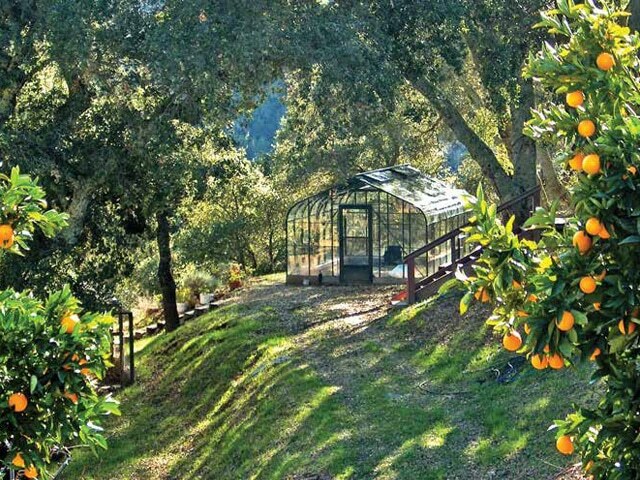 This year I will plant oranges in this little BC Greenhouse Builders house because I want to expand my year-round northern garden to include more fruit so I’ll get my dwarf orange trees in April from a local supplier. Four years ago I upped the ante, took the leap and built a larger 16 x 20 Pacific model greenhouse. The bigger house has a few extra features: water taps, temperature controlled fan system and electricity. The price of the bigger house is more like a cruise to Antarctica for one. I love to use both my small and big greenhouse and this means planning for the space on the ground, the space in the air and the space over time. March and April are the busiest times because I am growing for both my greenhouse and my outdoor garden. Cindy surprised me by telling me her raspberries bear fruit from April to October. (My outdoor variety only blooms in June and I pick fruit in July and August.) I was so impressed with Cindy’s inherited and unknown variety I immediately went over and gathered up her waste branches as she completed her winter pruning outdoors. I cut the trashed twigs into short stems with three buds each, plunged them into soil and put the trays over a heat mat so the bottom of the tray is warmer than the surrounding air. The heat, plus a rooting hormone, Stim-Root, encourages faster rooting. In two weeks, the raspberries root and buds burst into leaves. To keep the heat in during the first weeks I cover plants with fleece. The best time to take berry cuttings is in the dormant season so get out and canvas your neighborhood now for “cutting” opportunities. Remember this is a growing project for the greenhouse. Start plants now but move the rooted cuttings out to a cold frame or garden by late April or early May. For more details about propagating raspberries and roses from winter cuttings see my recent post. When I grow micro-green peas I enjoy the tender leaves in sandwiches and salads. Eventually, after all this cutting and re-cutting, the greens get woody. At this time you have two choices. Toss them into your compost pile or keep growing full-sized peas in the greenhouse. Last year I transplanted my Oregon Giant peas into my greenhouse in early March and they bloomed and produced peas by mid-April. If it is still too cold in your area to grow peas outside then give your spent micro-greens another chance in your greenhouse. It’s greenhouse growing at its best because you’ll pull out the pea plants inside to make room for fall greenhouse crops as soon as your outdoor peas start producing in late June. If you love crisp radishes right out of the garden consider broadcasting seed directly into your greenhouse soil now. Radish, spinach and arugula are crops that germinate at near freezing temperatures so even if the soil is still thawing in an unheated greenhouse it is warm enough to grow these early crops. If you heat your greenhouse, your options are broader but I let things unfold with the season, starting with these hardy crops. I love cauliflowers so I’ll start them this week with plans to plant some in the greenhouse in a month and some outdoors later. I harvest my greenhouse Snow Crown, Susanna and Veronica cauliflowers in June and a month later I eat plants from the same seeding date that are growing outdoors. The sun is on my face now and my soil is quickly warming. Before long it will be peak harvest in my greenhouse but right now late harvest and early seeding are overlapping. A greenhouse is a playground and a workhorse so enjoy every inch over time. As my friend’s tans fade, I’ll finish transplanting peas and sorting my seed to start early crops like cauliflower, broccoli, lettuce, arugula and spinach. If in doubt check your seed packets and start them indoors sooner. I am enjoying the sun in my greenhouse for about the same price as one winter vacation. Except I get to keep the greenhouse and it is guaranteed forever.